It should be no surprise why the i-Generation (named for the ubiquitous nature of the iPhone) is so passionate about the pro-life cause. They are the survivor generation, because they have survived the tragic U.S. Supreme Court ruling Roe v. Wade. As a result of Roe, nearly a million precious preborn babies lose their lives each year. These young people have lost brothers, sisters, cousins, and potential friends because of legal abortion. Their hearts grieve for the lost members of their generation. The i-Generation may have a reputation for being so obsessed with their cell phones they don’t care about the world around them. Don’t believe it. 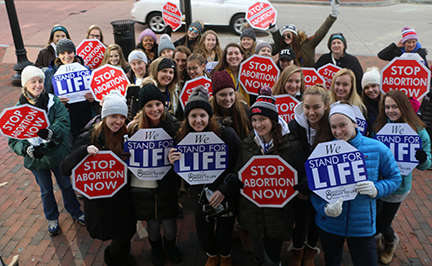 They are not just the future of the pro-life movement – they are its energetic present. May they be the generation that will finally toss Roe to the ash heap of history!